One of the largest and most prominent Kauai vacation rental companies on the island, The Parrish Collection Kauai, now offers new Kauai condos to choose from at the oceanfront Makahuena Resort. To celebrate their latest Poipu Beach rentals at Makahuena, the company is offering introductory rates from $125 nightly. Blackout dates are December 19 – January 6. Reservations can be made online or by calling The Parrish Collection Kauai at 800-325-5701. Makahuena Resort Is A Favorite Destination at Poipu Beach. With its spectacular setting on an ocean bluff and walking distance to some of the largest and bestKauai beaches on the South Shore, this Kauai resort has been a popular choice for those seeking a family getaway or a romantic Kauai vacation by the sea. Each of their two bedroom Poipu condos can accommodate between four to six guests and includes a full kitchen, lanai with ocean or garden view and choice of decor from casual to artfully designed interiors. The Parrish Collection Kauai also offers their exclusive Italian bath amenities by La Bottega, complimentary concierge service and a host of amenities including complimentary parking, free Wi-Fi and a washer/dryer in every condo. Kauai Activities are Plentiful at Makahuena Resort. Guests have complimentary use of the ocean view pool, tennis court and community barbecues. Stunning Kauai sunsets can be seen from this Kauai resort and Hawaii whales are viewed in winter. There are many other Kauai activities close by including a short 10 minute walk to Shipwreck Beach near The Grand Hyatt Kauai. More Condo and Home Owners Are Now Listing With Parrish Kauai. Known for unmatched professionalism, quality of product, as well as service and attention to detail second to none, The Parrish Collection Kauai has been serving vacationers and homeowners on Kauai’s South Shore for thirty years. With the largest collection of oceanfront properties on the South Shore and expanded Kauai vacation rentals on the North Shore, they have become the preeminent choice for guests on holiday and owners seeking a top rental company for their home. In addition to Makahuena Resort, they offer a vast range of choices from their Value Collection properties to the Elite Collection of luxury Kauai vacation rentals. 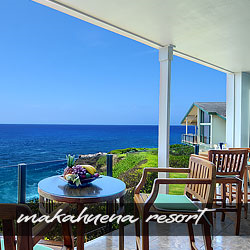 Makahuena Resort Promotion and Kauai Deals can be booked online. A minimum seven night stay is required and the non-refundable payment is due at time of booking. One change allowed after booking if the same unit is available and the new arrival date is within 30 days of your original arrival date. This offer applies to new reservations only and cannot be combined with any other special or promotion. Not valid between December 19 and January 6. Additional processing and cleaning fees apply per reservation. Rates plus 13.416% state tax.